The Retina is the light sensitive tissue which lines the inner surface of the eye. The optic lens of the eye creates an image of the visual world upon the retina. When light strikes the retinal tissue a chain of chemical and electrical events occur which allow us to see the images we perceive with our eyes. Retinal detachment may be caused by eye trauma, diabetic complications, inflammatory disorders or completely on its own. However the most common cause of retinal tearing and detachment is vitreous detachment, or the detachment of the vitreous fluid from the retina. 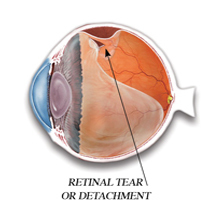 Retinal tearing and detachment if left untreated can result in severe vision loss and even blindness. Call the retina specialists at Newsom Eye today and have your eyes examined. Most retinal tears and detachments can be corrected when diagnosed early.